Where do I use my Attraction Tickets Direct voucher code? Attraction Tickets Direct offer tickets to places all over the world. Find affordable tickets for attractions in New York, Orlando, San Francisco, Los Angeles, San Diego, Las Vegas, Dubai, Paris, Rome, Spain and the UK. Whether you’re looking for discounted fares to the top London Attractions such as The Shard, Warner Bros. Studio or St Paul’s Cathedral, or low-cost tickets to world-famous attractions like the Burj Khalifa, Eiffel Tower, the Colosseum in Rome or the Rockefeller Centre you can find them all at Attraction Tickets Direct. As well as all this you’ll also find tickets to must-see places like Madame Tussauds, SEA LIFE centre, Broadway, LEGOLAND California, Moulin Rouge, Siam Park and UK theme parks like Alton Towers and Thorpe Park. 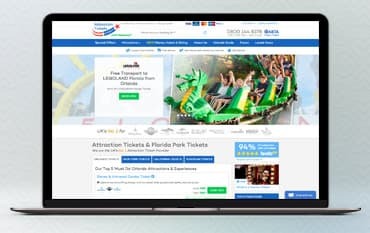 Find gate-ready theme park tickets that are always cheaper than the gate price and benefit from paying in instalments to help spread the cost of all attraction tickets. As well as all this ATD will also throw in loads of extras such as free tickets, discount vouchers, DVDs and top tips to help you make the most of your holiday with every ticket they sell. Discover Disney hotels and dining, an Orlando travel guide, special offers, a forum and even the latest news. You can also benefit from combo tickets, the Fastpass+, a free brochure and Olly’s blog- a handy information section where you’ll find tons of advice and tips about every destination that offers tickets through Attraction Tickets Direct. Attractions Tickets Direct offer an Orlando travel guide know as their ‘Expert View’. This guide will advise you on how to take full advantage of all the fun in store at Orlando by giving you all the tips and tricks used by official Florida experts. This handy advice will make sure you travel to Central Florida with all the insider knowledge you need to make your holiday a dream. Find information on everything from theme parks to lifestyle to dining and entertainment and ensure you're once in a lifetime trip to Orlando is one to remember. Attraction Tickets Direct place a huge emphasis on Orlando, providing tickets for a magnitude of attractions all around this sunshine state. Find Orlando combination ticket packages, tickets for Walt Disney World Resort, tickets for Universal Orlando, the Discovery Cove, SeaWorld, Aquatica, the Busch Garden in Tampa Bay and the Kennedy Space Centre. As well as all this you can also find tickets for LEGOLAND Florida, the Crayola Experience, Orlando sightseeing and transport, Fun Spot America, Orlando dining, shows, driving experiences, Miami and The Everglades plus much more. Take a look at the Orlando Freedom Ticket for access to a magnitude of parks around Disney World plus a whole bunch of free extras that’ll really make your holiday. There’s also the Expert View Orlando guide, the Orlando holiday planner and much more to help you with your booking. In the special offers section at Attraction Tickets Direct, you’ll find tons of offers on all kinds of attractions, sites and holiday extras for locations all around the world. Discover offers on Orlando Universal, Walt Disney World, LEGOLAND, multiple balloon rides, theme parks, dining options around Florida, FastPasses, Disney Memory Makers, Planet Hollywood, Macy’s, Siam Park and much more. With free gifts, up to 50% off and 3 for 2 on selected tickets you are sure to enjoy price reductions on all sorts of attractions no matter where you’re headed. If you wish to return your tickets, please let Attraction Tickets Direct know as soon as possible. You will also need to confirm your request by giving them notice via email. Any cancellation and return requests are subject to charges and will take effect once ATD has responded to your request and received the tickets back from you. Find cancellation and return charges here. Founded in 2002, Attraction Tickets Direct aims to make it easier for you to buy attraction tickets to the world's leading attractions. Since their inception Attraction Tickets Direct has helped over 4 million customers buy tickets for great attractions and destinations all over the world including Orlando, Disney World Resort, New York, Alcatraz, various Madame Tussauds around the globe, Warner Bros. Studios, The Grand Canyon, London and much more. Book online with an Attraction Tickets Direct voucher code from us and save money on all your tourist endeavours and experiences, no matter where you’re headed. We are constantly on the hunt for Voucher Codes for Attraction Tickets Direct to help you with your money saving. Our experts check dozens of sites for secret codes including NHS discounts, student sites & social media channels saving you time & money!